Continuing on with our look back on 2010 with summaries of five more of the Durham Bulls position players. In order of number of games played. Desmond Jennings (23). Came to the Durham Bulls in late 2009 (32 games). Called up to Rays 1 Sep 2010. Played in 109 games (458 plate appearances). 3 HR, 36 RBI, 37 SB (team best), 82 runs scored. .278/.362/.393. wOBA .354. bRAA 6.7. Positions played: CF-90, RF-8, LF-8. Jennings has been a top prospect from the day he joined the Rays system and he really is a good ballplayer. Batting leadoff, he does a decent job of getting on base (although a lower number of Ks would be nice). Obviously not a power hitter, most of his extra bases (25 2B and 6 3B came from speed). He is fast, and he was only caught stealing 4 times in 41 tries. He covers center field very nicely. Seems unlikely that he will return to the Bulls next year, even if he does not make the Rays postseason roster. Dan Johnson (30). Played almost all of 2008 as a Bull. Spent the 2009 season in Japan. Called up to the Rays in early August. Played in 98 games (426 plate appearances). 30 HR, 95 RBI, .303/.430/.624, wOBA .421, bRAA 30.3 (!). Positions played: 3B-36, DH-30, LF-22, 1B-14. Joe Dillon (34). With the Bulls at the end of 2009 (35 games) and all of 2010. Numbers slight up from 2009, but below his AAA career (8 seasons) averages. Played in 96 games (400 plate appearances). 9 HR, 57 RBI, .262/.334/.405, wOBA .321, bRAA -5.3. Positions played: 2B-75, 1B-12, 3B-5, DH-3, C-1. I already liked Joe Dillon a lot before his heroic crawl to the plate on May 27th, but after that he was one of my favorite Bulls on the year. He was not quite a regular player after that injury and in the last games of the playoffs it was reported that 2010 would be his last year. If so, here’s to him. I grew to enjoy watching that rolling gait as he trotted onto the field, his steady presence, and his willingness to play any position, to do just about anything to win. J.J. Furmaniak (30). 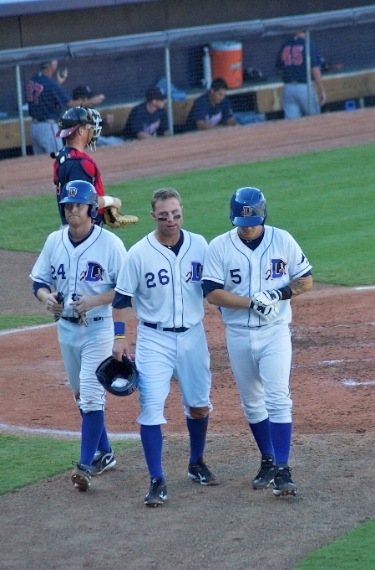 Started the year on the Durham Bulls disabled list. Went to Montgomery for a while then came to Durham on May 28 when Joe Dillon when on the disabled list. Veteran minor leaguer playing at the AAA level since 2004 (with a year in Japan). Played in 77 games (334 plate appearances). 1 HR, 22 RBI, .264/.366/.352, wOBA .342, bRAA 1.7. Positions played: 2B-42, SS-21, 3B-14, RF-2, DH-1. J.J. is a very good infielder and was a real asset to the team all year. After the early tours of Ryan Shealy and Hank Blalock (which was part of why J.J. started the year in Montgomery), the Bulls had several players they could rotate around all the infield positions, giving Montoyo a lot of flexibility throughout the year. J.J. was also spectacular in the playoffs, playing in every game and accumulating terrific numbers over the nine games — .353/.463/.529 — with a home run, triple, and double. I’m pretty sure he was a non-roster invite to the Rays spring training this year. On his record, seems to me he has a good chance of that happening again in 2011. Jose Lobaton (25). Jose Lobaton is part of the Rays confusing (to me) catcher situation. In his case, it started when he was claimed from the Padres in 2009. He began the 2010 season in Montgomery, but came up to the Bulls in early April when John Jaso went to the Rays. Jaso stayed with the Rays, Lobaton stayed with the Bulls. He is on the Rays’ 40-man roster. Played in 72 games (271 plate appearances). 7 HR, 33 RBI, .261/.337/.394, wOBA .334, bRAA -0.7. Positions played: C-62, DH-8. In some ways Lobaton is just now getting started as a professional ballplayer, even though he has eight years behind him. This was only is second season in AAA. In general, he looks pretty good from our place in the stands and we haven’t noticed him make any bad decisions on the field. He is more fit than his recored would indicate. In addition, we are unsure of our own ability to evaluate catchers, given the success of John Jaso with the Rays. When Dioner Navarro got sent down by the Rays, that cut into Lobaton’s playing time quite a bit. Assuming he’s back next year, we can expect him to be the Bulls “senior” catcher. At the end of the Bulls’ season, he was subject to some Tampa Bay gamesmanship that limited his ability to help the Bulls in the playoffs. Note: wOBA and bRAA stats are from StatCorner.